Spending more time developing fitness skills in physical education classes pays off with more active students at Central Elementary School in Albemarle, N.C. according to research from Pfeiffer University. Students in Krista Scronce’s physical education classes were able to use the nationally recognized Skillastics™ system to significantly improve physical activity levels during physical education class time. Physical activity was measured using piezoelectric devices specific to each student. The classes using Skillastics™ were able to add about two-hundred more steps and spend more than an extra minute in moderate to vigorous activity (MVPA) when compared to other 4th grade physical education classes. Incredibly, this improvement was observed after using Skillastics™ for a very small portion of the class time. Physical activity is a dependent variable in overall quality of life and positively associated with academic performance (Gill DL et al.2013, Rasberry, CN et al 2011). Meaning, these steps improve student’s health and ability to succeed academically. All 4th grade students receive fifty minutes of physical education per week in physical education classes at Central Elementary School. The Skillastics™ system was used for the first ten minutes in half of the 4th grade classes over eight class meetings. All fourth-grade classes received the same instruction taught by Ms. Scronce, except for the ten minutes of Skillastics®. The Skillastics™ classes were then compared to the other fourth grade classes. 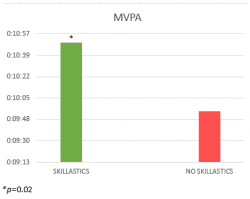 Following the eighth class meeting the amount of MVPA significantly increased in the Skillastics™ groups. “Using the Skillastics System was easier than I expected and the students appeared to enjoy the short focus on skills” Krista reported. The research is part of an ongoing partnership with the Health and Physical Education Department at Pfeiffer University.